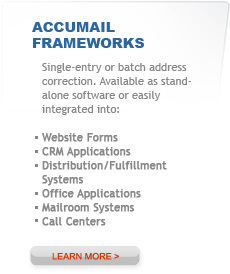 Whether you are a Financial Institution looking to ensure the accuracy of your customer address data, a Call Center wanting to increase the efficiency of entering customer address information, or a Mailing House looking for an all-in-one address hygiene and postal presorting application, we have a solution for you. In an ever-changing world, our software and services are evolving to meet the requests of our customers, and our goal is always to provide the best possible solution for the needs of your organization. To enable you to find exactly what you are looking for, we have divided our services into the following categories. If you have any additional questions please contact us. 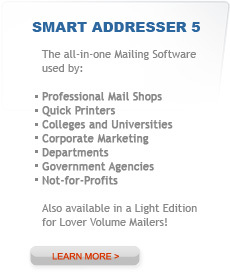 Maximize your postal discounts with our industry-leading mailing software. Fully PAVE™and CASS Certified™, our mailing software offers full support for the IM® Barcode as well as offering real-time NCOALink processing, so you can keep track of your customers as they move. From web storefronts to production management, online estimating to shipping and fulfillment, PressWise provides an all-in-one comprehensive solution. Perfect for printers of all sizes looking to grow their business and streamline their operations, PressWise offers a complete, web-based, end-to-end solution.